Avalanche dog teams train for years to become validated by C-RAD, in hopes of one day being deployed and putting their skills to use in the field. We spoke with dog handler Greg Dumas about his deployment on his first mission in April, 2018. We wanted to know what the experience was like for him and his dog, Sasha. 1. Tell us a little about you and Sasha. How long have you been a dog team and how long have you been certified? I have been a patroller at Arapahoe Basin for 8 years and affiliated with our dog program and CRAD for about 4-5 of those years, mainly since taking on my role as a dog handler with Sasha in 2015. 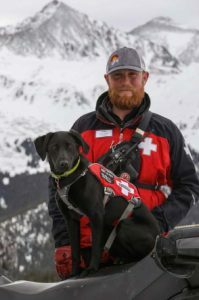 Most avalanche rescue dogs take about 2-3 years to train and validate to the C-RAD standard, often training to their own in-house ski resort standards in the process. Sasha and I passed both our A-Level test at Arapahoe Basin and our C-RAD test in the same season of 2017-2018. 2. What's it like when you first get a call that you're being deployed? What was your emotional response? Did Sasha have a different reaction? The day of our deployment I can be honest in saying that we were on high alert from the time we called in as an available team that morning. It was the first warm, bluebird day after a few day-long snow cycle with 30+ inches of new snow and decent wind transport. That's the perfect recipe for an avalanche accident, and we knew backcountry travelers would be getting out there. People like skiing and riding in fresh snow, and the warm, clear weather will often trump safety considerations in group decision making. When we got the call for deployment, we were ready to go. I was up top with Sasha anyway, which was convenient, because our helicopter [landing zone] is just a few hundred yards from our summit patrol building. Keith Hiller, the avalanche technician who flew with us, was transported from the top of [Pallavicini Lift] via snowmobile and we were ready to go in 5-10 minutes, by the time the helicopter landed and unloaded their crew. We had our gear and skins ready up top and had everything we needed. It was exciting, in every sense of the word. This is what we train for, and while there is some nervousness and anxiousness, really this was a chance to do the job we train for all winter long. Dogs are different than humans, in terms of how they react to situations, and working dogs are no exception. They are creatures of habit, so, for her, having done dozens of drills that season, having loaded and unloaded helicopters in her training, she was just going to work. She doesn't differentiate between training and the real thing. Dogs view all training as work; it's a game to them. She was psyched. Her crate is her safe place in our patrol building, so she knows that when she is taken out and leashed up, she's going to work. Regardless of whether it's a drill or the real thing, the dogs bring their best to the table every time. 3. Describe the process of being deployed, and tell us about your particular mission. Our mission was initiated by a 9-1-1 call from one of the snowmobilers involved, the reporting party, who called in a snowmobile-triggered avalanche near Georgia Pass. In the case of this accident, the sizeable avalanche buried his companion, and, while they were both wearing transceivers, he was unable to locate a signal in the avalanche debris. Dispatch notified the Summit County Sheriff who initiated a call out to Summit County Search and Rescue and available ski area deployment teams. From the time we got our call, and got picked up by Flight for Life, at least 30-40 minutes had passed since the avalanche occurred, mainly because the reporting party had waited about 15-20 minutes to call after the slide. We arrived and landed on-scene after assessing the surrounding area and potential hazard to us as rescuers, deciding that it was in our best interest to land in the debris at the bottom of the slide. We quickly learned that despite both snowmobilers wearing beacons, the buried victim was not transmitting - later we learned that he had not turned it on. So instead of being a beacon search, we would need to rely on Sasha and our RECCO device. After a quick interview with the reporting party, we went about searching the site from the bottom. We had a point last seen, and quickly found his snowmobile, so logic led us to believe he was somewhere between the two. That is where I started my search with Sasha. 4. What was it like putting all your training to the test? How did you feel while you were in the field working with Sasha and the rest of the team? Despite the tragedy of the accident, it was a great experience in putting all of our training to the test. And while a live recovery is the goal of our training, body recovery is also a valuable offering to the victim's family and friends, as well as to the rest of the search and rescue community involved. By working quickly and safely with limited resources on scene, we were able to keep dozens of potential rescuers from having to travel to the scene, which is always better. As far as the search itself, we had good information to go on, and things went well. We ended up having a second team on the way, so we had about 20 minutes with nobody else on scene but the reporting party, whom we put to work continuing his beacon search. Sasha and I worked our way up the lookers right of the path in the debris, the area between the point last seen and the snowmobile. Within about 20 minutes, Sasha alerted to a scent and began digging, just as she had trained. I pulled out my probe and on the second attempt I had a strike on a body. Searching with Sasha was an adrenaline-filled experience. Everything went smoothly as far as searching the area we wanted to clear first, and, thankfully, our suspicions were correct and he was right about where expected. Things also went well working with Flight for Life and, later, Breckenridge Ski Patrol, who deployed a second team to scene and helped with transporting the victim and managing the scene with our reporting party, as well as getting us all safely back to the trailhead. 5. You and Sasha received a commendation for your work. What did it feel like to be able to help someone and bring closure to a tragic situation? It was really cool to be recognized by the Summit County Sheriff's Office. Those of us on deployment have a unique relationship in Summit County with our sheriff department and Flight for Life, as well as our local search and rescue group, which allows for the work that we do together to go as smoothly as it does. Closure is very important with situations like this. I think having us there on scene was really important for the friend who survived, our reporting party, who was going through some heavy emotions. Also for the family of the victim. 8. Anything else you'd like to add about being deployed, the mission or about continuing to be a dog team? Trying to focus on quality drills over quantity, training weekly is ideal, to keep us stoked for deployments and ready to go! We are also trying to train more at Arapahoe Basin with [avalanche technicians], so full scenario deployment drills, as realistic as we can.